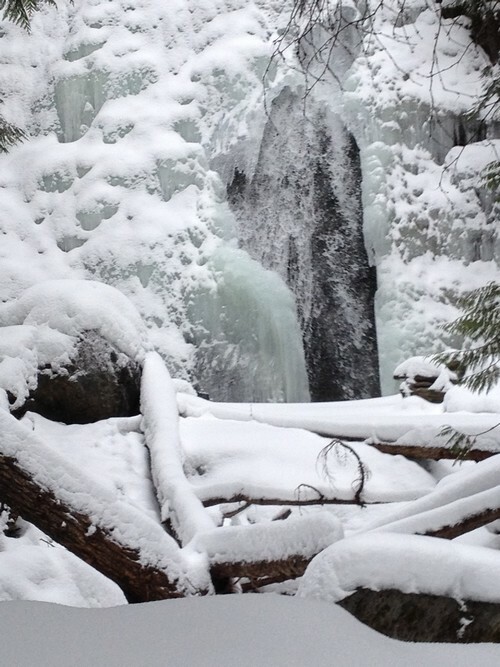 Insider info – there is a somewhat secret Sun Peaks waterfall (also known as the Whitecroft or McGillivray Creek Waterfalls) that most visitors to Sun Peaks Resort and even long-time residents don’t even know exists! In fact, if you have been to Sun Peaks before, you have probably passed right by it without even knowing. No chairlift is required to get there and it can easily be done after a day of enjoying some of the other best Sun Peaks hikes and winter, spring, fall or summer activities. It is about a 15 minute drive outside of Sun Peaks, right by Whitecroft. Or view it as part of a Sun Peaks Winery and Waterfall Tour. It isn’t huge, but it also isn’t difficult to get to in all four seasons without any special gear (although snowshoes help if there is a ton of fresh pow). We love to visit this picturesque waterfall every time we are up there and it looks different every time we go. In the midst of winter, you can hear the water falling but you can’t see it because of the layer of ice that builds up in front. NOTE: From time-to-time, cougars have been sighted in the area. Please be careful - make lots of noise when visiting, and keep pets and children safe and close to you at all times. Please respect this beautiful location and waterfall! Take only photos, leave only footprints, enjoy the memories. The water fall is about 15 feet high and is very picturesque, with lots of beautiful lightly wooded scenery along the way. 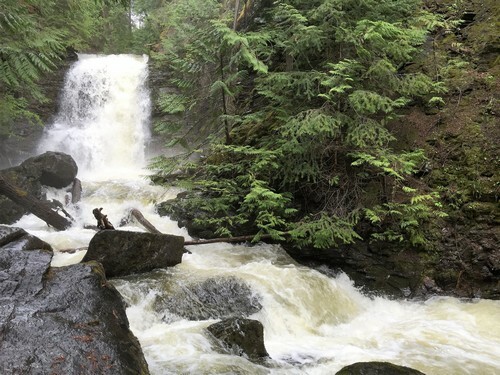 While we refer to it as the Sun Peaks Waterfall, it is actually the McGillivray Falls as the waterfall is fed from local runoff as well as McGillivray Lake which is up near Sun Peaks village and where many popular Sun Peaks summer activities take place. 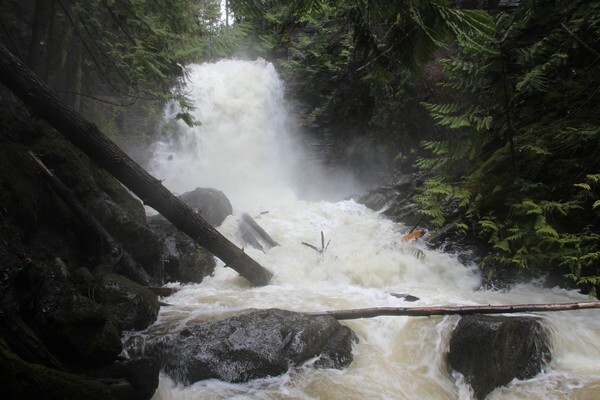 The creek is actually used as part of the Whitecroft village water supply, so as with anywhere, please ensure you treat the area, the creek, and the falls with care. Pack out what you may pack in, and be respectful. We certainly think it's worth the 10-15 minute walk each way so come on up and give it a try! It will seem even more serene after a nice little Sun Peaks Winery Tour to the local Thompson Shuswap wineries that have opened up recently or Okanagan wineries a little further afar. Or perhaps a quick drive and a nice walk after a fantastic morning on the slopes in the winter or a wonderful game of golf at Sun Peaks in the summer? Please consider our beautiful Sun Peaks rental condo or luxurious, family-friendly townhouse for you Sun Peaks Waterfall visit. 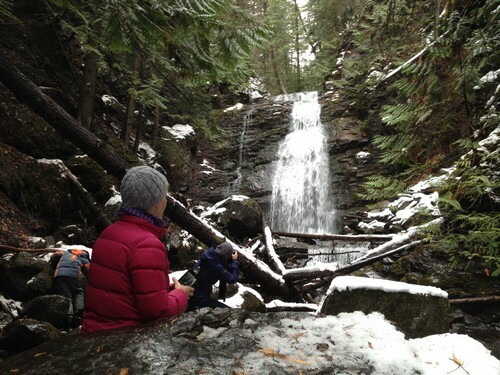 The waterfall is located about 10-15 minutes away from the resort area, and is just past the village of Whitecroft which you drive through on your way up the hill. About 25 or so feet further up the hill, you will see a pathway going up past two big cement blocks – that’s the route to the waterfall. Continue on around 500 yards or so up, past a small cement damn, past a large block rock outcropping which will be on your left, and past a small little waterfall in the creek to your right. As you carry-on along the creek, you will start to hear the larger waterfall up ahead. Continue on until you come to the opening, where you can stop to admire the falls, take pictures, or even enjoy a picnic. But be careful and talk loudly along the way – you are in the wilderness and you want to ensure any possible wildlife hears you coming and heads back into the deeper woods. Should we recommend this short walk to other Best Sun Peaks guests or not? Please let us know by completing the form below – but remember – shhhh – the Waterfall is a little secret, and please be respectful!